It’s impossible to take a high-quality action video on your phone, right? That was certainly true in the past, but today there are a number of factors that make it possible to take videos on your phone with exceptional quality. First of all, phone cameras continue to get better and better. Phones like the iPhone 7 offer amazing video quality. Secondly, a tool called a gimbal can provide unbelievable video stabilization that can take your Iphone’s videos to the next level. I’ve put together a list of the 10 best iPhone 7 gimbals to help you find the right one for you. Most gimbals have the same basic design with a vertical stick. The FeiyuTech SPG Plus offers something entirely unique with a two handle design. This offers a bit more control and some added stability. 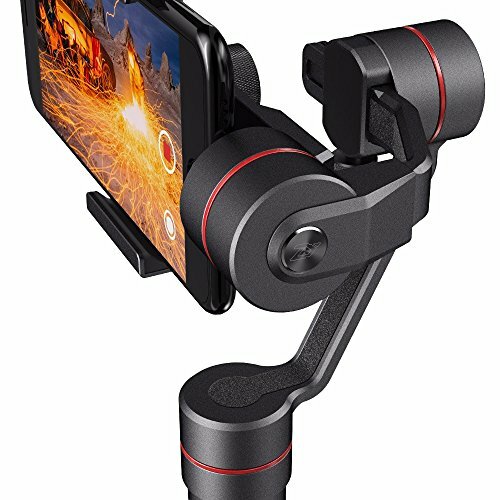 Of course, the two handle design on the Feiyu Smartphone Stabilizer can also be seen as a negative since you may not always have two hands available when filming a video. It’s easy to get some great shots using the 360-degree limitless panning, 320-degree tilting, and 100-degree rolling. The motorized gimbal has an altitude sensor that will automatically shift from horizontal to vertical mode when tilted while keeping the video stable. Another big advantage of this gimbal is that the design leaves a lot of room for accessories. There are five 1/4-inch screw ports to add things like a microphone and a flash. There is no problem balancing the phone even when a lot of accessories are added on because of the two-handle design. You don’t need to use counterweights like you do on some other gimbals. That said, the maximum weight it can handle is 220 grams, so you will not get good results if you use a lot of heavy accessories at the same time. You can also connect the gimbal to a tripod if desired. The SPG Plus features a 22650 Li-ion battery that can give you up to eight hours of power before needing to be charged. You can also connect it to a power bank while in use for some added juice. Unfortunately, you can’t charge your iPhone right from the gimbal’s battery. The gimbal has a one-year limited warranty. Verdict: The FeiyuTech SPG Plus offers a unique design with some major advantages including great stability and flexibility. The design might not be ideal for those who want to be able to keep one hand free while shooting with their Iphone 7. The EVO SP gimbal is ready to start working right out of the box. 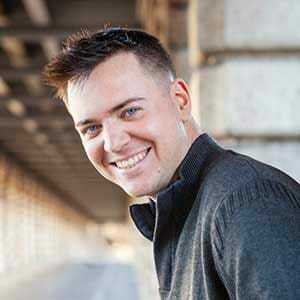 There’s no complicated setup or the need for special software or an app. Once you connect your iphone and turn the pre-configured gimbal on, you just have to give it a minute to calibrate and then you’re ready to start shooting. A threaded end cap lets you mount the gimbal to a tripod if desired. Two 18350 li-ion batteries are included with this gimbal as well as a charging cable. The battery life isn’t great but you can get a few hours of shooting in. You cannot charge you phone directly from the gimbal. This gimbal may not offer a ton of battery power, but it does offer excellent stabilization thanks to the high-torque motor. There are four modes (heading follow mode, heading lock mode, heading/pitch follow mode, and inverted mode) and all offer very good quality. The gimbal does not work well with added accessories but it’s a very good gimbal for basic iPhone 7 filming. EVO backs the SP with a one-year 1 year USA parts & labor warranty. Verdict: This isn’t the best iphone 7 gimbal on the market but it can definitely get the job done. If you don’t need all the bells and whistles and just want a basic gimbal, you’ll be satisfied with the EVO SP. Live video is where it’s at today for many people. 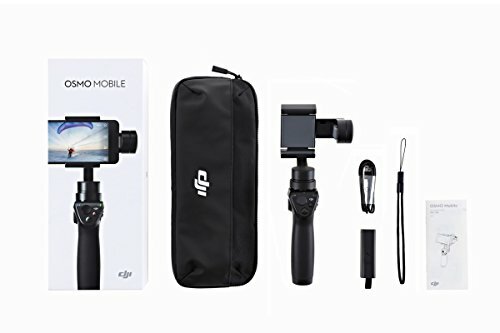 If you’d like to share a perfectly stabilized high-quality video on YouTube Live or Facebook Live, the DJI OSMO Mobile gimbal is perfect for you. The DJI GO app makes this simple. In addition to the option to live stream to YouTube and Facebook, this gimbal has a few other advantages. The joystick controls are easy to use and let you smoothly invert, pan, or tilt. It’s one of the smaller gimbals you’ll find which is nice for carrying it around with you. The Osmo mobile stabilizer also has a comfortable ergonomic design that won’t strain your hand over long periods of shooting with your Iphone. Even though it’s smaller and ergonomically designed, it is on the heavy side so it could potentially get tiring to hold after a while. One issue with the OSMO Mobile for iPhone 7 users is that the optical image stabilization of the phone will conflict with the stabilization mechanism of the gimbal. As two different things fight to try to keep your picture stable, it results in a wobble. If you disable the OIS on your Iphone 7, you won’t have this problem and your video will be stable. The battery of the OSMO Mobile will last for around 4.5 hours but you can extend this with an external battery pack. You cannot charge your phone from the gimbal’s power source. This gimbal has a one-year limited warranty. Verdict:This is a great compact gimbal that lets you easily live stream video from your Iphone-7 to YouTube and Facebook, making it the perfect option for many people for that reason alone. Many gimbals use special apps but they don’t all offer all that much. The Zhiyun Smooth III features an iOS app that can make your videos a lot better. It lets you customize all your settings. It also lets you control things like exposure, ISO, and white balance. You can even use various filters. The app also lets you use a few additional functions like time lapse, long exposure, and panoramic imaging. This app can really add a lot to your filming experience and overall video quality. Beyond the excellent IOS app, the Smooth III offers the quality stabilization you want in a smartphone gimbal. It shoots in three modes: pan following mode, locking mode, following mode. It does best in the pan following and locking modes but struggles a bit in the following mode. 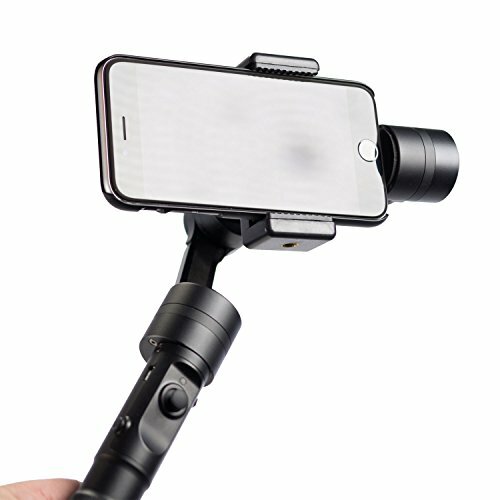 There is a universal 1/4” threaded hole on the bottom that lets you mount the handheld gimbal to a tripod or an extension arm. With a maximum payload of 260 grams, you can add accessories like lenses or microphones without messing with the balance. The Zhiyun Smooth III uses a 26650 Li-Ion battery which you charge with an included USB charger. You can shoot for a full day with this battery before needing to recharge. Unfortunately, you cannot charge your phone directly from the gimbal. A nice carrying case is included for the gimbal which might not seem like it would matter, but a case like this one can make transporting the gimbal a lot more convenient. Zhiyun does not appear to offer a warranty for the Smooth III. Verdict: This is a decent gimbal made with the iphone7 in mind, that offers stellar battery life, a nice carrying case, and an app that offers some real value. 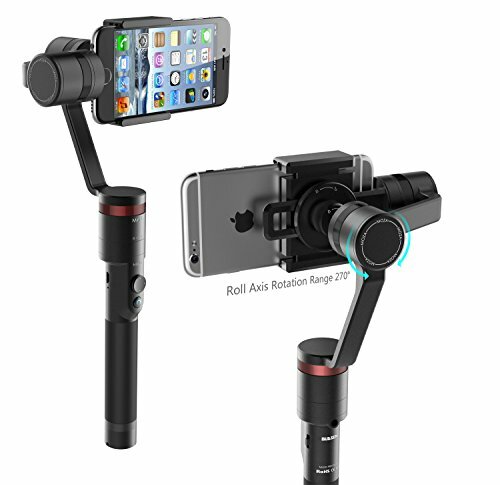 What makes this gimbal stand out is the inclusion of a wearable kit. It works as a standard gimbal with a traditional design but it can also be converted into a wearable design that lets you shoot video completely hands-free. It’s also compatible with a number of other kinds of mounting equipment like tripods and cranes. In addition to the flexibility in mounting this gimbal offers, there is a lot of flexibility in shooting modes as well. There are a number of different modes, all of which offer great stabilization and precision. The MOZA app increases this flexibility yet further by offering extra options like panoramic mode and time lapse. The 18650 lithium battery gives you up to eight hours of battery life with the option to connect an external battery pack to the integrated 5V USB port. Although you aren’t able to charge your phone right from the gimbal’s power supply, you could possibly charge with an external battery attached to the gimbal. MOZA offers a one-year warranty for this gimbal. Verdict:The MOZA Mini-C is a flexible gimbal with good battery life that stands out for having a wearable kit that lets you shoot video hands-free. 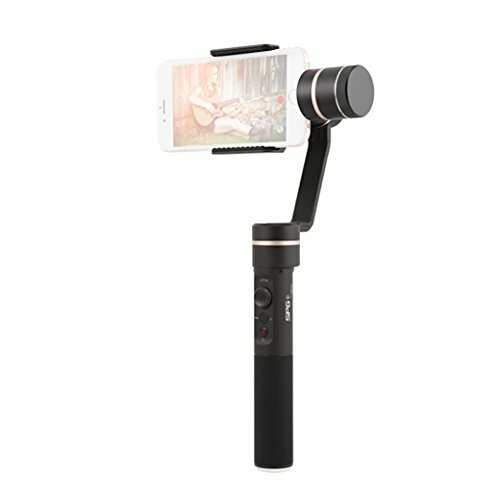 Despite coming in at a fairly low price point, the Zhiyun Smooth-Q Gimbal has a lot to offer, making it a high-value choice for your iphone 7. The battery life is one factor that makes this gimbal worth looking at. The 26650 Li-ion battery gives you 12 hours of operating time. A unique and really helpful feature is that you can use the gimbal’s power supply to also charge your phone’s lightning port while shooting using the USB port. You can also plug in apple and various accessories like soft lights to this power supply. Another thing that gives this gimbal a lot of value is its ability to withstand extremes in temperature and weather. You could shoot an epic snowboarding video, for example, without worrying about the cold or snow impacting the gimbal’s performance. This gimbal has a maximum payload of 220 grams, so you can add on accessories like lenses, microphones, or lights. There isn’t a need to counterbalance even with the added weight from accessories. Overall, the performance of this gimbal is quite good with excellent smartphone stabilization, smoothness, and accuracy. The response time can be just a bit too slow when panning and tilting with the joystick controls but that might not bother you. The Zy Play IOS app available on the apple store and that you need to use with this gimbal is just okay. It certainly works but it doesn’t offer as much as some other gimbal Iphone apps. The Smooth-Q is extremely lightweight and it comes with a convenient carrying case. Zhiyun does not appear to offer a warranty for the Smooth-Q. Verdict: The Smooth-Q gives you a lot of value for your money, with a number of fantastic features. The battery life and the ability to charge your phone are particularly noteworthy. The EVO Shift is another gimbal that offers great battery life, promising up to 10 hours of run-time. It also lets you charge your iPhone through the lightning connector, right from the gimbal’s power supply, a really convenient feature that lets you get through a long session of shooting without the need to stop and recharge either device. Although gimbals are traditionally all about video and this gimbal certainly helps with that, the Shift has a unique ability to take exceptionally good panoramic photos. It can take 180° & 330° panoramic shots and also stitch together nine images into a high-resolution 3×3 photo sphere. If you spent a lot of time in nature, this panorama ability might make this the best gimbal for you. The EVO APP available on the itunes store has a few nice features including improved tracking ability from the Smart-Track technology and the ability to connect to social networks to stream live video. That said, the iOS app has had some problems. There is no need for counterweights for balancing but it’s a bit of a learning curve at first to figure out how to get the phone properly balanced. EVO offers a 1-year warranty on parts and labor. Verdict: This is a very good gimbal that takes smooth and accurate video but it stands out for its ability to take incredible panoramic photos as well. The EVO Shift gimbal is a great tool to use with a smartphone or action camera that will give you high-quality footage. This gimbal offers superior image stabilization, leading to smooth footage that looks like it was taken with professional equipment. You can use the EVO Shift with pretty much any smartphone, including the extra large iPhone and Android models. It also works with action cameras like the GoPro. Whether a smartphone or an action camera, the only qualifier is that it has to weigh under 220g. It operates on 3 axes: pan, tilt, and roll. There are a few different modes that let you take different kinds of footage and a 4-way joystick that lets you fine-tune the shooting angle. One of coolest features of the EVO Shift is the ability to lock onto a particular person or object. As they move, the camera will move along with them, keeping them within the frame. The EVO Shift also offers the ability to take panoramic photos and motion timelapses. The handheld base of the Lanparte HHG handheld stabilizer is pretty large, so it might be uncomfortable for those with particularly small hands. For average and larger hands, though, it will be a good fit and a very comfortable one thanks to the silica gel handle grip. This is definitely nice if you’re doing a lot of filming. If you’re using Apple accessories like lenses or a microphone, you’ll likely need to use the included counterbalance weights. 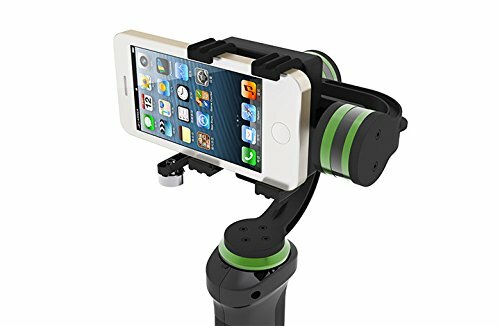 This Handheld gimbal helps create a really smooth Iphone 7 video, thanks in large part to the wrist-controlled tilt and pan action. The battery life on the HHG-01 is quite good, though you will see it drain faster when using a heavier overall payload. The battery life will also suffer if you don’t have the balance set to be just right. It takes some practice getting used to the counterbalance weights. You cannot charge your phone from the gimbal’s power source. One advantage for some people is that this gimbal comes with a special clamp to use with a GoPro. You could sometimes shoot on your iPhone 7 and other times shoot on your GoPro. Lanparte offers a 1-year warranty on parts including free gimbal replacement if warranted. Verdict: This is a decent gimbal that uses a counterbalance weight system but can handle some extra accessories. It comes with a GoPro clamp as well as the clamp that will hold an iPhone so it affords some versatility of shooting method. It’s natural to want durability in any electronic device and this gimbal won’t disappoint. It’s constructed from a new alloy of 7000 series Aluminum, the same grade favored by the aerospace industry. This construction means it is both strong and lightweight, the perfect combination for a mobile gimbal. The performance is not quite space-grade, but it does okay down here on the ground. It is particularly good at stability and smoothness thanks in part to its ultra fast sampling rates. 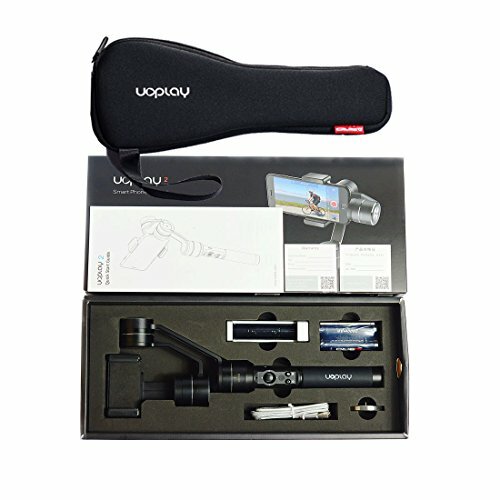 There are a number of helpful accessories available for this gimbal, including a tripod, a remote control, and a carrying case, but you have to buy them separately. The 2600mAh 18650 battery keep the gimbal working for around 10 hours. Your iPhone 7 can borrow some of this power supply as needed with the integrated USB charging port. Two batteries are included so you can have a backup charged and ready to go as you prepare for a long day of filming. Aibird doesn’t appear to offer a warranty for this gimbal. Verdict: There’s nothing wrong with this gimbal, but the best thing it has going for it is the strong material it’s made from. Otherwise, it doesn’t really stand out. This is another gimbal that lets you share live broadcasts to social media pages via the Moza app. You must download this app in order to pair the phone with the gimbal. The app is primarily just used for calibration and adjusting settings but in addition to streaming live video to Facebook and other social networks, you can also control the gimbal from the app itself. When shooting video on your phone, though, it will typically be easier to just use the 4-way joystick controller. A 1/4 inch screw mount on the bottom lets you connect it to a tripod or other piece of photography equipment as desired. The 18650 lithium battery gives you about four hours of run-time. You cannot charge your phone from this power source. Elecwave offers a one-year warranty for the EW-Mini C.
Verdict: This is a perfectly fine gimbal but it doesn’t offer anything particularly excellent, making it not the best value when compared to other gimbals compatible with the iphone 7. How much difference will I see in my iPhone 7 videos with a stabilizer? The iPhone 7 utilizes Optical Image Stabilization, a feature that makes a big difference. However, even with OIS, there is no comparison between a regular iPhone 7 video and one shot with a stabilizer. A gimbal will make the videos you shoot on your iPhone 7 look like they were taken with expensive professional camera equipment. A video stabilizer is something you have to experience to see how transformative it is, but I’ve never known anyone who has regretted getting one. Especially if you’re taking videos to be shared in some way, it’s the difference between hard-to-watch versus can’t-look-away and amateur versus professional. Are 3-Axis gimbals a lot better than cheap mechanical iPhone stabilizers? As we move through the world, we’re operating in a 3-axis way. There is movement that is up-down, backward-forward, and left-right. Sometimes these various movements are subtle, but those three directional planes are always involved in some way. When filming a video, what makes the film jerky or bumpy is the interplay between those three planes. Cheap mechanical iPhone stabilizers aren’t operating on all three planes so they can’t fully solve the stability problem. A 3-axis gimbal is not only responding to movement in all three directional planes but doing so instantaneously. The technology is fast and smooth, providing you with significantly better stabilization and quality than you can get from anything else. Do I really need a gimbal? A gimbal is a tool that can make your life better but it’s not one that everyone will get an equal amount of value out of. If you are using film you shoot in any kind of professional way, a gimbal could help your career. Do you shoot videos with any kind of action component for YouTube or some other platform? your viewers will be much happier with footage shot using a gimbal. If you want to make family movies that look like they were shot by a professional videographer, a gimbal would be a good investment. Are you an aspiring filmmaker but can’t afford all the top of the line equipment? a gimbal is a great way to turn your iPhone 7 into a more powerful tool to make great films. A gimbal is one of those gadgets that can make a big positive difference in your life, or at least in the quality of your videos. Mobile gimbals will keep your video stabilized and smooth even when you are moving around. Motors compensate for shaking and bumps, resulting in a video that is much more enjoyable to watch. A smartphone like the iPhone 7 that has a great camera plus a gimbal is a recipe for video magic. I’ve spent a lot of time researching and testing these gimbals and I’ve found that using a 3 axis handheld gimbal and an iPhone 7 together can be a great replacement for a camcorder or a GoPro. The video quality you get is great for home videos but can also work well for making YouTube videos or even indie films. The difference between a video shot on an iPhone with and without stabilization from a gimbal is staggering. Have you ever used a gimbal? Leave a comment if you have any questions about gimbals or tell us what you would want to record a video of if you had a gimbal.